The list of shipwrecks in November 1917 includes some ships sunk, foundered, grounded, or otherwise lost during November 1917. United States) arrived, and her crew looted the wreck of Al-Ki. United States The schooner was wrecked on the French Frigate Shoals, in the Pacific Ocean north west of Hawaii. Norway The cargo ship collided with another vessel and sank. Her crew were rescued. Imperial German Navy) with the loss of two of her crew. She was beached at Collo, Algeria but was a total loss. United States With no one on board, the 12-gross register ton, 35-foot (10.7 m) fishing vessel sank at Wrangell, Territory of Alaska. Royal Navy) with the loss of all 26 crew. Denmark The schooner was wrecked in the Vestmannaeyjar, Iceland. Her crew were rescued. United States During a voyage from Solomon to Nome, Territory of Alaska, with three crewmen and one passenger aboard, the 10-gross register ton, 39-foot (11.9 m) passenger vessel became frozen in ice in Pastol Bay off the coast of Alaska and was lost. All on board survived. Imperial German Navy). She was beached but was declared a constructive total loss. Imperial German Navy) with the loss of 35 of her crew. Royal Navy The Coastal Motor Boat was lost on this date. Imperial German Navy) with the loss of four of her crew. She was beached but was declared a total loss. Imperial German Navy World War I: The decoy vessel was sunk in the Kattegat by Royal Navy destroyers. Imperial German Navy) with the loss of 23 of her crew. San Francesco di Paola G.
Royal Navy World War I: The naval trawler struck a mine and sank in the Irish Sea off the Bailey Lighthouse, Howth, County Dublin with the loss of all hands. Imperial German Navy). Her crew survived, but her captain was taken as a prisoner of war. United States Navy The barge sank on this date. Imperial German Navy World War I: The Großes Torpedoboot 1913-class torpedo boat struck a mine and sank in the North Sea off Walcheren, Zeeland, Netherlands with the loss of four of her 83 crew. Imperial German Navy) with the loss of 38 of her crew. Norway World War I: The cargo ship struck a mine and sank in the North Sea 8 nautical miles (15 km) north east of Spurn Point, Yorkshire, United Kingdom. Her crew survived. Imperial German Navy) with the loss of 21 of her 94 crew. Imperial German Navy). She was beached at La Calle and was not refloated until December 1919. Imperial German Navy) with the loss of one of her six crew. Three survivors reached land in their lifeboat, the other two were rescued by SM U-63. Imperial German Navy) with the loss of all 24 crew. Regia Marina The Padus-class monitor ran aground and sank in the Adriatic Sea off Caorle, Venice. Imperial German Navy) with the loss of 13 of her crew. Imperial German Navy) with the loss of eleven of her crew. Imperial German Navy) with the loss of six of her crew. Imperial German Navy). Her five crew took to the lifeboats but were not rescued. United Kingdom World War I: The cargo ship struck a mine and sank in the North Sea 9 nautical miles (17 km) south east of Southwold, Suffolk (52°15′30″N 2°00′00″E﻿ / ﻿52.25833°N 2.00000°E﻿ / 52.25833; 2.00000). Her crew survived. Imperial German Navy) with the loss of 26 of her 69 crew. United States The schooner was wrecked at Bacuranao, Cuba. Her crew were rescued. Imperial German Navy) with the loss of eight of her 72 crew. Imperial German Navy) with the loss of fourteen of her crew. Italy World War I: The cargo ship struck a mine and sank in the Tyrrhenian Sea off Livorno, Tuscany. Her crew survived. Imperial German Navy) with the loss of three of her crew. Imperial German Navy) with the loss of nineteen of her crew. United Kingdom World War I: The collier struck a mine and sank in the North Sea off Lowestoft, Suffolk (52°26′N 1°48′E﻿ / ﻿52.433°N 1.800°E﻿ / 52.433; 1.800) with the loss of three of her crew. Royal Navy the naval trawler collided with another vessel and sank in the English Channel off the Isle of Wight. United States). Trappers reported finding her boiler on the beach at Lituya Bay in 1932, but it soon was covered by sand. Regia Marina The Alfredo Cappellini-class monitor capsized and sank in the Adriatic Sea off Ancona. Royal Navy) in the English Channel off Le Havre, Seine-Inférieure, France. Imperial German Navy) with the loss of 28 crew. Imperial German Navy) with the loss of three crew. France World War I: The sailing vessel struck a mine and sank in the English Channel off Dieppe, Seine-Inférieure. Imperial German Navy) with the loss of five crew. Imperial German Navy World War I: The A26-class torpedo boat struck a mine and sank in the North Sea with the loss of eighteen of her crew. United Kingdom and sank in the Atlantic Ocean 110 nautical miles (200 km) west of Gibraltar with the loss of 21 of her 91 crew. Survivors were rescued by Rose. United Kingdom World War I: The cargo ship struck a mine and sank in the Indian Ocean 25 nautical miles (46 km) west of Bombay, India with the loss of nine of her crew. Imperial German Navy) with the loss of five of her crew. United States Navy) with the loss of two of her 40 crew. Imperial German Navy World War I: The Type UC II submarine struck a mine and sank in the English Channel (50°08′N 3°42′W﻿ / ﻿50.133°N 3.700°W﻿ / 50.133; -3.700) with the loss of all 26 crew. United Kingdom World War I: The coaster was torpedoed and sunk in the Atlantic Ocean 14 nautical miles (26 km) west of the Eddystone Lighthouse by a Kaiserliche Marine submarine. Imperial German Navy) with the loss of seventeen of her crew. Imperial German Navy). She drifted ashore and sank with the loss of nine crew. Royal Navy) off the coast of Denmark. All 56 crew were rescued by HMS Blonde, which scuttled the ship. United States) which she had rescued earlier in the month – and a cargo of 25,000 cases of salmon and 1,200 tons of copper ore, the 3,158-gross register ton, 314-foot (95.7 m) cargo liner ran aground on a reef – thereafter known as Mariposa Reef (56°22′45″N 133°42′00″W﻿ / ﻿56.37917°N 133.70000°W﻿ / 56.37917; -133.70000﻿ (Mariposa Reef)). All on board were rescued by the vessels Curacao, Jefferson, and Ravalli (flags unknown). After 6 hours 38 minutes on the reef, Mariposa slid off and sank in deep water. Royal Navy The auxiliary minesweeper collided with another vessel and sank off Harwich, Essex. Imperial German Navy World War I: The Type UC II submarine departed Hamnskär, Finland. No further trace, believed struck a mine and sank in the Baltic Sea with the loss of all 26 crew. United Kingdom and landed at Milford Haven, Pembrokeshire, United Kingdom. Imperial German Navy) with the loss of 57 lives. Imperial German Navy) with the loss of fifteen of her crew. Imperial German Navy) with the loss of 26 of her crew. Imperial German Navy World War I: The Type 1915 minesweeper was shelled and damaged by Royal Navy ships on an unknown date and beached. She was refloated and sank under tow in the North Sea on this date. United Kingdom) with the loss of twelve of her crew. United Kingdom The collier was lost in the Atlantic Ocean on this date. Imperial German Navy) and was abandoned. She came ashore on Pantelleria but was a constructive total loss. Imperial German Navy). She was scuttled the next day (36°10′N 20°40′W﻿ / ﻿36.167°N 20.667°W﻿ / 36.167; -20.667). United Kingdom World War I: The cargo ship struck a mine and sank in the North Sea 35 nautical miles (65 km) east of Girdle Ness, Aberdeenshire with the loss of a crew member. Imperial German Navy) with the loss of twelve of her crew. Norway The cargo ship foundered in the Pacific Ocean (approximately 34°N 161°W﻿ / ﻿34°N 161°W﻿ / 34; -161). Sixteen of her crew survived. Imperial German Navy The A26-class torpedo boat struck a mine and sank in the North Sea off the coast of Belgium with the loss of seventeen of her crew. Imperial German Navy) with the loss of all hands. Imperial German Navy) with the loss of four of her crew. Imperial German Navy) with the loss of 31 crew. Royal Navy) and was scuttled with the loss of nineteen of her 36 crew. United Kingdom) with the loss of a crew member. Imperial German Navy). She was beached but was later refloated. United States Navy. Subsequently repaired and returned to service. Italy World War I: The cargo ship struck a mine and sank in the Gulf of Genoa off Varazze, Liguria. Italian Royal Navy The Medusa-class submarine was beached by a storm in the Adriatic Sea at Rimini, Italy. She later was refloated, repaired, and returned to service. Imperial German Navy) with the loss of one crew member. Imperial Russian Navy World War I: The destroyer struck a mine and sank in the Baltic Sea off Rauma, Finland. Imperial German Navy) with the loss of eight of her crew. United Kingdom World War I: The fishing smack was shelled and sunk in the English Channel 16 nautical miles (30 km) south east of Start Point, Devon by a Kaiserliche Marine submarine. Italian Royal Navy The Pullino-class submarine was beached by a storm at Magnavacca, Italy, on the night of 27-28 November. Refloated in January 1918, she was found to be damaged beyond repair. United Kingdom World War I: The coaster struck a mine and sank in the English Channel 3 nautical miles (5.6 km) south west of Cap Gris Nez, Pas-de-Calais, France with the loss of six of her crew. United Kingdom) (51°55′N 1°40′E﻿ / ﻿51.917°N 1.667°E﻿ / 51.917; 1.667). Her crew survived. Imperial German Navy) with the loss of a crew member. She was beached in the Belfast Lough but was later refloated. United States World War I: The tanker struck a mine and was damaged in the Gulf of Genoa with the loss of a crew member. She reached port at Genoa, Italy but was declared a total loss. Imperial German Navy) with the loss of 77 lives. United Kingdom World War I: The cargo ship was torpedoed and sunk in the North Sea 25 nautical miles (46 km) south by east of Flamborough Head, Yorkshire by a Kaiserliche Marine submarine. 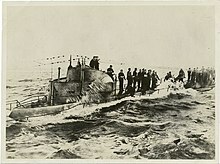 Imperial German Navy World War I: The Neuwerk-class Vorpostenboot was sunk by mines west of Terschelling. Royal Navy The motor launch was lost on this date. Imperial German Navy). She was beached but was later refloated, repaired and returned to service. Imperial German Navy World War I: The Type UB III submarine struck a mine and sank in the North Sea (53°52′N 4°58′E﻿ / ﻿53.867°N 4.967°E﻿ / 53.867; 4.967) with the loss of all 34 crew. Imperial German Navy) with the loss of 25 of her crew. Imperial Russian Navy World War I: The minesweeping boat struck a mine and sank in the Baltic Sea off Rauma, Finland. France World War I: The tug struck a mine and sank in the English Channel off Cap de la Hague, Manche. Sweden The wooden schooner was last heard from in the last days of October departing Dalarö bound for Stettin. The Swedish official history of war losses finds it "not unlikely" that German mines in the southern Baltic Sea were the cause of her disappearance. Her crew of nine was lost. United States The scow was lost at Ketchikan, Territory of Alaska. United States) in the Pacific Ocean off the coast of Washington and sank with the loss of four of the 61 people on board. United Kingdom The cargo ship departed from Glasgow, Renfrewshire in early November for a South African port. No further trace, presumed foundered with the loss of all hands. ^ a b c "Shipping casualties". The Times (41626). London. 3 November 1917. col F, p. 10. ^ "Margam Abbey". Uboat.net. Retrieved 9 November 2012. ^ "Marigo". Uboat.net. Retrieved 8 December 2012. ^ "Acary". Uboat.net. Retrieved 26 October 2012. ^ "Bur". Uboat.net. Retrieved 4 November 2012. ^ "Cape Finisterre". Uboat.net. Retrieved 25 November 2012. ^ a b c d e f g h i j k l m n o p q r s t u v w x y z aa ab ac ad ae af ag "BRITISH MERCHANT SHIPS LOST to ENEMY ACTION Part 3 of 3 - September 1917-November 1918 in date order". Naval History. Retrieved 24 January 2013. ^ a b c d e f g h i j "BRITISH NAVAL VESSELS LOST AT SEA Part 1 of 2 - Abadol (oiler) to Lynx (destroyer)". Naval History. Retrieved 2 February 2013. ^ "Farraline". Uboat.net. Retrieved 26 December 2012. ^ "Guahyba". Uboat.net. Retrieved 26 October 2012. ^ "Jessie". Uboat.net. Retrieved 4 November 2012. ^ "Decoy Vessels of WWI , Converted Merchant Ships, Kaiserliche Marine, (Germany)". Navypedia. Retrieved 2 October 2018. ^ "Maria Di Porto Salvo". Uboat.net. Retrieved 4 October 2012. ^ "Rochester". Uboat.net. Retrieved 24 October 2012. ^ "San Francesco Di Paola G." Uboat.net. Retrieved 4 October 2012. ^ "McIntosh Boat & Shipbuilders of Portessie & Ianstown, Buckie, Scotland". Glenn McIntosh. Retrieved 5 February 2013. ^ "Essichia". Uboat.net. Retrieved 8 December 2012. ^ "Nefeli". Uboat.net. Retrieved 9 December 2012. ^ "Antaeus". Uboat.net. Retrieved 9 November 2012. ^ "Border Knight". Uboat.net. Retrieved 25 November 2012. ^ "Gimle". Uboat.net. Retrieved 4 November 2012. ^ "Irina". Uboat.net. Retrieved 8 October 2012. ^ "Longwy". Uboat.net. Retrieved 29 December 2012. ^ "Lyra". Uboat.net. Retrieved 22 December 2012. ^ "Amberton". Uboat.net. Retrieved 9 November 2012. ^ "Caterina". Uboat.net. Retrieved 8 December 2012. ^ "Hildar R." Uboat.net. Retrieved 16 October 2012. ^ "Kai". Uboat.net. Retrieved 16 October 2012. ^ "Benor". Uboat.net. Retrieved 11 November 2012. ^ "Peveril". Uboat.net. Retrieved 16 October 2012. ^ "Obj". Uboat.net. Retrieved 8 October 2012. ^ a b c "Major Warships Sunk in World War 1 1917". World War I. Retrieved 23 February 2013. ^ "Suntrap". Uboat.net. Retrieved 31 October 2012. ^ "Villemer". Uboat.net. Retrieved 9 December 2012. ^ "Lindhardt". Uboat.net. Retrieved 11 November 2012. ^ "The Marquis". Uboat.net. Retrieved 29 December 2012. ^ Sergeaunt, B. E. (1922). "Chapter 5". Isle of Man and the Great War. Douglas, Isle of Man: Brown & Sons Ltd.
^ "Ardglamis". Uboat.net. Retrieved 16 October 2012. ^ "Ballogie". Uboat.net. Retrieved 16 December 2012. ^ "Frithjof Eide". Uboat.net. Retrieved 12 November 2012. ^ "Isabelle". Uboat.net. Retrieved 16 December 2012. ^ "Rizal". Uboat.net. Retrieved 9 November 2012. ^ "Lapwing". Uboat.net. Retrieved 24 October 2012. ^ "Dana". Uboat.net. Retrieved 16 December 2012. ^ "Lapwing". Uboat.net. Retrieved 18 November 2012. ^ "HMS M15". Uboat.net. Retrieved 9 December 2012. ^ "Casualty reports". The Times (41635). London. 14 November 1917. col F, p. 13. ^ "HMS Staunch". Uboat.net. Retrieved 9 December 2012. ^ "Thuringia". Uboat.net. Retrieved 24 October 2012. ^ "Anteo". Uboat.net. Retrieved 6 December 2012. ^ "Barbary". Uboat.net. Retrieved 5 December 2012. ^ "Huibertje". Uboat.net. Retrieved 16 December 2012. ^ "Morning Star". Uboat.net. Retrieved 2 November 2012. ^ "Amelie". Uboat.net. Retrieved 3 December 2012. ^ "Ardmore". Uboat.net. Retrieved 24 October 2012. ^ "Atlas". Uboat.net. Retrieved 10 November 2012. ^ "Australbus". Uboat.net. Retrieved 3 December 2012. ^ "Axminster". Uboat.net. Retrieved 18 November 2012. ^ "Axwell". Uboat.net. Retrieved 10 November 2012. ^ "Carlo". Uboat.net. Retrieved 24 October 2012. ^ "Buenaventura". Uboat.net. Retrieved 6 October 2012. ^ "Dolly Warden". Uboat.net. Retrieved 12 October 2012. ^ "Wrecks". Wight Spirit Diving Charters. Retrieved 11 February 2013. ^ "Panaghia". Uboat.net. Retrieved 9 December 2012. ^ "Panormitis". Uboat.net. Retrieved 9 December 2012. ^ a b c d e f "BRITISH NAVAL VESSELS LOST AT SEA Part 2 of 2 - M.15 (monitor) to Zylpha (Q-ship)". Naval History. Retrieved 12 February 2013. ^ "Prophet". Uboat.net. Retrieved 28 December 2012. ^ "Trowbridge". Uboat.net. Retrieved 16 October 2012. ^ "De Dollart". Uboat.net. Retrieved 21 October 2012. ^ "Garron Head". Uboat.net. Retrieved 25 October 2012. ^ "Gasconia". Uboat.net. Retrieved 16 October 2012. ^ "Jules Verne". Uboat.net. Retrieved 23 December 2012. ^ "Kyno". Uboat.net. Archived from the original on 22 February 2013. Retrieved 16 October 2012. ^ "Margaret L. Roberts". Uboat.net. Retrieved 26 October 2012. ^ "Naalso". Uboat.net. Retrieved 27 December 2012. ^ "Adolph Andersen". Uboat.net. Retrieved 30 December 2012. ^ "Clan Maccorquodale". Uboat.net. Retrieved 10 November 2012. ^ "Lalen Mendi". Uboat.net. Retrieved 10 November 2012. ^ "Modemi". Uboat.net. Retrieved 17 December 2012. ^ "Western Coast". Uboat.net. Retrieved 6 November 2012. ^ "Antwerpen". Uboat.net. Retrieved 30 December 2012. ^ "HMS Candytuft". Uboat.net. Retrieved 6 October 2012. ^ "Gisella". Uboat.net. Retrieved 30 December 2012. ^ "ps MARS". Clydesite. Retrieved 13 February 2013. ^ "Amiral Zedu". Uboat.net. Retrieved 30 December 2012. ^ "Aparima". Uboat.net. Retrieved 6 November 2012. ^ "Clangula". Uboat.net. Retrieved 30 December 2012. ^ "Farn". Uboat.net. Retrieved 2 November 2012. ^ "Jutland". Uboat.net. Retrieved 30 December 2012. ^ "1915 Type Minesweepers, Mine Warfare ships, German Navy". Navypedia. Retrieved 27 September 2018. ^ "Minnie Coles". Uboat.net. Retrieved 11 November 2012. ^ "Morococala". Uboat.net. Retrieved 3 December 2012. ^ "Robert Brown". Uboat.net. Retrieved 30 December 2012. ^ "Saint Andre". Uboat.net. Retrieved 11 November 2012. ^ "Commendatore Carlo Bruno". Uboat.net. Retrieved 16 October 2012. ^ "Megrez". Uboat.net. Retrieved 10 October 2012. ^ "Nederland". Uboat.net. Retrieved 10 October 2012. ^ "Robert Morris". Uboat.net. Retrieved 22 October 2012. ^ "Aros Castle". Uboat.net. Retrieved 22 October 2012. ^ "Maine". Uboat.net. Retrieved 10 November 2012. ^ "Mossoul". Uboat.net. Retrieved 16 October 2012. ^ "Schuylkill". Uboat.net. Retrieved 6 October 2012. ^ "Sobra". Uboat.net. Retrieved 26 October 2012. ^ "Clan Cameron". Uboat.net. Retrieved 11 November 2012. ^ "Conovium". Uboat.net. Retrieved 24 October 2012. ^ "Elsena". Uboat.net. Retrieved 24 October 2012. ^ "Francesco Patrino". Uboat.net. Retrieved 7 November 2012. ^ "King Idwal". Uboat.net. Retrieved 20 October 2012. ^ "Kohistan". Uboat.net. Retrieved 6 December 2012. ^ "Krosfond". Uboat.net. Retrieved 10 November 2012. ^ "Siracusy". Uboat.net. Retrieved 7 November 2012. ^ "Start". Uboat.net. Retrieved 11 November 2012. ^ "Norwegian steamer lost in a storm". The Times (41643). London. 23 November 1917. col C, p. 13. ^ "Tijuca". Uboat.net. Retrieved 26 October 2012. ^ "La Blanca". Uboat.net. Retrieved 24 October 2012. ^ "Luigina". Uboat.net. Retrieved 6 December 2012. ^ "Markella". Uboat.net. Retrieved 6 October 2012. ^ "Ocean". Uboat.net. Retrieved 31 October 2012. ^ "Trombetas". Uboat.net. Retrieved 26 October 2012. ^ "Westlands". Uboat.net. Retrieved 10 October 2012. ^ "Actaeon". Uboat.net. Retrieved 21 October 2012. ^ "Dunrobin". Uboat.net. Retrieved 10 October 2012. ^ "Enna". Uboat.net. Retrieved 17 October 2012. ^ "French Rose". Uboat.net. Retrieved 21 November 2012. ^ "Nyassa". Uboat.net. Retrieved 10 November 2012. ^ "Pomone". Uboat.net. Retrieved 30 December 2012. ^ "Sabia". Uboat.net. Retrieved 24 October 2012. ^ "Iniziativa". Uboat.net. Retrieved 25 December 2012. ^ "Karema". Uboat.net. Retrieved 6 October 2012. ^ "Oriflamme". Uboat.net. Retrieved 22 December 2012. ^ "Ostpreussen". Uboat.net. Retrieved 21 November 2012. ^ "Ovid". Uboat.net. Retrieved 28 December 2012. ^ "Ango". Uboat.net. Retrieved 12 November 2012. ^ "Drot". Uboat.net. Retrieved 24 October 2012. ^ "Johan Mjelde". Uboat.net. Retrieved 26 October 2012. ^ "Pontida". Uboat.net. Retrieved 6 December 2012. ^ a b Gray, Randal, ed., Conway′s All the World′s Fighting Ships 1906-1921, Annapolis, Maryland: Naval Institute Press, 1985, ISBN 0-87021-907-3, p. 276. ^ "Almond Branch". Uboat.net. Retrieved 10 November 2012. ^ "Bjäditelny". Uboat.net. Retrieved 21 December 2012. ^ "Bleamoor". Uboat.net. Retrieved 12 November 2012. ^ a b c "BRITISH FISHING VESSELS LOST to ENEMY ACTION Part 2 of 2 - Years 1917, 1918 in date order". Naval History. Retrieved 2 February 2013. ^ "Eastfield". Uboat.net. Retrieved 10 November 2012. ^ "Gladys". Uboat.net. Retrieved 26 December 2012. ^ "Groeswen". Uboat.net. Retrieved 21 November 2012. ^ "Notre Dame De Rostrenen". Uboat.net. Retrieved 25 October 2012. ^ "Premier". Uboat.net. Retrieved 17 October 2012. ^ "Tungue". Uboat.net. Retrieved 10 November 2012. ^ "Ville De Thann". Uboat.net. Retrieved 23 December 2012. ^ "Agenoria". Uboat.net. Retrieved 24 October 2012. ^ "Albert Watts". Uboat.net. Retrieved 6 December 2012. ^ "Apapa". Uboat.net. Retrieved 24 October 2012. ^ "Jane Radcliffe". Uboat.net. Retrieved 28 December 2012. ^ "Jeanne Conseil". Uboat.net. Retrieved 11 November 2012. ^ "Perm". Uboat.net. Retrieved 12 October 2012. ^ "Bob". Uboat.net. Retrieved 4 November 2012. ^ "Neuwerk Patrols (1916-1917), Escorts, Kaiserliche Marine (Germany)". Navypedia. Retrieved 15 September 2018. ^ "Haugastøl". Uboat.net. Retrieved 4 November 2012. ^ "Pierre". Uboat.net. Retrieved 12 October 2012. ^ "Texas". Uboat.net. Retrieved 11 November 2012. ^ "UB61". Uboat.net. Retrieved 11 November 2012. ^ "Courage". Uboat.net. Retrieved 12 October 2012. ^ "Derbent". Uboat.net. Retrieved 24 October 2012. ^ "Gazelle". Uboat.net. Retrieved 12 October 2012. ^ "Kalibia". Uboat.net. Retrieved 12 November 2012. ^ "Molesey". Uboat.net. Retrieved 12 November 2012. ^ "Mt 1". Uboat.net. Retrieved 21 December 2012. ^ "Remorquer No.8". Uboat.net. Retrieved 30 December 2012. ^ "Missing British steamer". The Times (41690). London. 18 January 1918. col E, p. 6.